Aston Villa manager Martin O'Neill will allow Wales defender Mark Delaney the chance to prove his fitness this summer before deciding on his future. The 30-year-old did not play for Villa this season because of knee problems. But an operation by acclaimed American surgeon Dr Richard Steadman appears to have solved the long-standing injury. "Mark's contract ends in June but I will look at this and I think it is only right we should be looking after him until he is fit," O'Neill said. "If Mark's current programme goes according to plan, he would be hoping to be joining in with us towards the end of July - and I am happy for that to be the case. "Then we will be in a better position to assess what is happening with him, hopefully by the end of July to mid-August." Delaney will continue to undergo rehabilitation work at the club's new training complex at Bodymoor Heath for the next couple of months. "Mark has been out of the game a fairly lengthy time but, in terms of keeping him at the club until he gets fit, it is our duty to do that and then we will see what develops," O'Neill added. 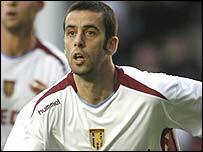 Delaney has been at Villa for nearly eight years but has become increasingly prone to injury in recent seasons. Meanwhile, O'Neill is already thought to be making plans to strengthen his squad, with his former Scottish Premier League stomping ground one possible source of talent. Kilmarnock striker Steven Naismith and Heart goalkeeper Craig Gordon are reported targets.